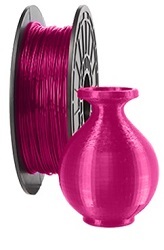 Dremel PLA filament has been designed and tested to work with your 3D Idea Builder and is simply the best filament to match your Dremel 3D printer. Dremel PLA filament has been specifically engineered for optimal printing with your Idea Builder. PLA is a thermal plastic that softens and melts when it’s heated, building your designs strand by strand and layer by layer. Dremel's PLA has been designed to melt at a temperature compatible with the Idea Builder, producing a stable, strong object with a high quality finish. Pink is a youthful, fun, and exciting color that is symbolic of happiness and hope. A pink object can provide feelings of caring, tenderness, self-worth, love and acceptance. Get creative and use the color for models with an in intense but inspiring and comforting impact on your environment.